Apologies to those in northern climes, where fall is surely on its way. I should have posted this in early summer. But here in Southeast Asia, we’re just getting the first whiff of dry air, of the season closest to “summer” as we know it in the United States. This light and refreshing chicken salad seemed the perfect thing to order the other day, in Siem Reap. 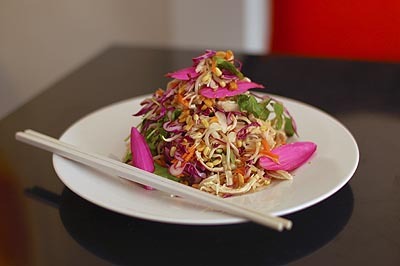 Shredded chicken and cabbage with fresh herbs and bean sprouts, drizzled with lime, garnished with edible petals — it reminded me of the first such salads I had in Vietnam many years ago. Peel the garlic and set aside two cloves. Boil the chicken with remaining whole cloves of garlic. Do not overcook chicken; let cool and cut into thin strips. Mince the remaining two cloves of garlic and combine with cooled chicken in a bowl. Save a pinch of each herb for garnishing, and chop the rest into small pieces; add to the bowl. Toss in the onion, pomelo, carrot, cabbage and rice vinegar. Stir thoroughly; add chili sauce, fish sauce, lime, salt and pepper according to your preference. Drizzle with sesame oil and let the mixture sit at least half an hour. Before serving, add more lime, fish sauce, sesame oil and/or chili if necessary to bring out the flavors. Just tried your 2006 recipe for chicken salad (over a link from Saveur, now my most beloved magazine–I suscribed to Gourmet for thirty years and feel like one of my old friends has died, but Saveur´s good too–no substitute but some good recipes–) the salad was good but I had to let it wait until the next day and it got rather soggy and watery. The idea is great and the asian tastes are lovely. Thanks!